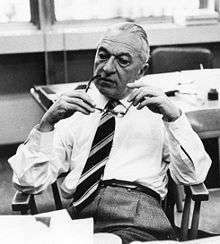 Bruno Benedetto Rossi (13 April 1905 – 21 November 1993) was an Italian experimental physicist. He made major contributions to particle physics and the study of cosmic rays. A 1927 graduate of the University of Bologna, he became interested in cosmic rays. To study them, he invented an improved electronic coincidence circuit, and travelled to Eritrea to conduct experiments that showed that cosmic ray intensity from the West was significantly larger than that from the East. Forced to emigrate in October 1938 because of the Italian Racial Laws, Rossi moved to Denmark, where he worked with Niels Bohr, then to Britain, where he worked with Patrick Blackett at the University of Manchester, and finally to the United States, where he worked with Enrico Fermi at the University of Chicago, and later at Cornell University. Rossi stayed in the United States, and became an American Citizen. Rossi was born to a Jewish family in Venice, Italy. He was the eldest of three sons of Rino Rossi and Lina Minerbi. His father was an electrical engineer, who participated in the electrification of Venice. Rossi was tutored at home until the age of fourteen, after which he attended the Ginnasio and the Liceo in Venice. After beginning his university studies at the University of Padua, he began advanced work at the University of Bologna, where he received a Laurea in Physics in 1927. His thesis advisor was Quirino Majorana, who was a well-known experimentalist and uncle of the physicist Ettore Majorana. In 1928, Rossi began his career at the University of Florence, as assistant to Antonio Garbasso, who founded the University's Physics Institute in 1920. It was located in Arcetri, on a hill overlooking the city. When Rossi arrived, Garbasso was Podestà of Florence, appointed by Benito Mussolini's fascist government of Italy. However, he brought to the institute a group of brilliant physicists which included Enrico Fermi and Franco Rasetti before they moved to Rome, as well as Gilberto Bernardini, Enrico Persico, and Giulio Racah. In 1929, Rossi's first graduate student, Giuseppe Occhialini, was awarded the doctoral degree. In spite of this distraction, Rossi was able to complete, in 1933, an experiment on the East-West effect that he had begun before leaving Arcetri. Because this effect is more prominent near the equator, he organised an expedition to Asmara in Eritrea, which was then an Italian colony on the Red Sea at a latitude of 15° N. With Sergio De Bennedetti, he set up a "cosmic ray telescope", which consisted of two separated GM counters in coincidence, whose axis of maximum sensitivity could be pointed in any direction. It soon became apparent that cosmic ray intensity from the West was significantly larger than that from the East. This meant that there was a larger influx of positive primary particles than of negative ones. At the time, this result was surprising, because most investigators held the preconceived notion that the primaries would be negative electrons. Rossi, Bruno (1959). "High-energy cosmic rays". Sci. Am. (published Nov 1959). 201 (5): 135–46. doi:10.1038/scientificamerican1159-134. PMID 14439229. 1 2 3 4 5 6 7 8 9 10 11 12 Clark, George W. (1998). "Bruno Benedetto Rossi". Biographical Memoirs (PDF). 75. Washington: National Academies Press. pp. 310–341. ISBN 978-0-309-06295-4. Retrieved 13 November 2012. ↑ "Bruno Benedetto Rossi: Ph.D., Bologna, 1927" (PDF). Chemistry?Physics Library. University of Notre Dame#Libraries/Hesburg Libraries; University of Notre Dame. 23 March 2009. Retrieved 9 November 2012. ↑ "Bruno Benedetto Rossi" (PDF). University of Notre Dame. Retrieved 8 July 2013. ↑ "Ettore Majorana as a guide in Quirino Majorana's experiments. Original letters and documents on an experimental and theoretical collaboration" (PDF). Proceedings of Science. Retrieved 8 July 2013. 1 2 Reeves, Barbara J. (2008). "Garbasso, Antonio Giorgio". Complete Dictionary of Scientific Biography 2008. New York: Charles Scribner's Sons. 0684315599. Retrieved 13 November 2012. ↑ Rossi, Bruno Benedetto (1990). Moments in the Life of a Scientist. Cambridge University Press. pp. 4–5. ISBN 978-0-521-36439-3. ↑ Bothe, Walther; Walter Kolhörster (1929). "Das Wesen der Höhenstrahlung". Zeitschrift für Physik. 56 (1–12): 751–777. Bibcode:1929ZPhy...56..751B. doi:10.1007/BF01340137. Retrieved 11 November 2012. ↑ Rossi, Bruno Benedetto (1964). Cosmic Rays. McGraw-Hill. p. 43. ISBN 978-0-07-053890-0. Retrieved 14 November 2012. ↑ Rossi, Bruno (26 April 1930). 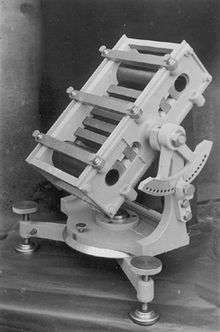 "Method of Registering Multiple Simultaneous Impulses of Several Geiger's Counters". Nature. 125 (3156): 636–636. Bibcode:1930Natur.125..636R. doi:10.1038/125636a0. Retrieved 11 November 2012. ↑ Rossi, Bruno Benedetto (1990). Moments in the Life of a Scientist. Cambridge University Press. pp. 9–13. ISBN 978-0-521-36439-3. ↑ Chapman, Sydney (1958). "Fredrik Carl Mulertz Stormer. 1874–1957" (PDF). Biographical Memoirs of Fellows of the Royal Society. 4: 257–279. doi:10.1098/rsbm.1958.0021. Retrieved 14 November 2012. ↑ Rossi, Bruno (3 July 1930). "On the Magnetic Deflection of Cosmic Rays". Physical Review. 36 (3): 606–606. Bibcode:1930PhRv...36..606R. doi:10.1103/PhysRev.36.606. Retrieved 9 December 2012. 1 2 Rossi, Bruno Benedetto (1990). Moments in the Life of a Scientist. Cambridge University Press. p. 18. ISBN 978-0-521-36439-3. ↑ Rossi, Bruno (1932). "Absorptionmessungen der durchdringenden korpuskularstrahlung in einem meter blei". Naturwissenschaften. 20 (4): 65. Bibcode:1932NW.....20...65R. doi:10.1007/BF01503771. Retrieved 17 November 2012. ↑ Rossi, Bruno (1 March 1933). "Uber die eigengschaften der durchdringenden korpuskularstrahlung in Meeresniveau". Zeitschrift für Physik. 82 (3–4): 151–178. Bibcode:1933ZPhy...82..151R. doi:10.1007/BF01341486. Retrieved 16 November 2012. ↑ Rossi, Bruno Benedetto (1990). Moments in the Life of a Scientist. Cambridge University Press. pp. 19–21. ISBN 978-0-521-36439-3. ↑ Heilbron, John L. "Oral History Transcript — Dr. P.M.S. Blackett. See paragraph IV.C.3.". Center for History of Physics; Niels Bohr Library & Archives. American Institute of Physics. Retrieved 15 November 2012. ↑ Anderson, Carl D. (28 February 1933). "The Positive Electron". Physical Review. 43 (6): 491–494. Bibcode:1933PhRv...43..491A. doi:10.1103/PhysRev.43.491. Retrieved 22 December 2012. ↑ "The Nobel Prize in Physics 1948". The Nobel Foundation. Retrieved 9 July 2013. ↑ "History of the Institute of Physics". Department of Physics "Galileo Galilei". University of Padova. Retrieved 17 December 2012. ↑ Rossi, Bruno (April 2005). "Cosmic Ray Observations in Eritrea". Research notes of Bruno Rossi, 1933. MIT Institute Archives & Special Collections. Retrieved 17 December 2012. ↑ McGervey, John D. "Sergio De Benedetti, 1912–1994". Scientific.Net. Retrieved 17 December 2012. ↑ Johnson, Thomas H. (11 April 1933). "The azimuthal asymmetry of the cosmic radiation". Physical Review. 43 (10): 834–835. Bibcode:1933PhRv...43..834J. doi:10.1103/physrev.43.834. Retrieved 18 December 2012. ↑ Alvarez, Luis; Arthur H. Compton (22 April 1933). "A positively charged component of cosmic rays". Physical Review. 343: 835–836. Bibcode:1933PhRv...43..835A. doi:10.1103/physrev.43.835. Retrieved 18 December 2012. ↑ Rossi, Bruno (25 November 1933). "Directional measurement on the cosmc rays near the geomagnetic equator". Physical Review. 45 (3): 212. Bibcode:1934PhRv...45..212R. doi:10.1103/PhysRev.45.212. Retrieved 18 December 2012. ↑ Alvarez, L. W.; Rossi, Bruno; Chromey, Frederick C. (15 May 1946). "Vertical Determination Device". Patent number: 2706793. US Patent and Trademark Office. Retrieved 8 February 2013. ↑ Rossi, Bruno Benedetto (1990). Moments in the Life of a Scientist. Cambridge University Press. pp. 38–39. ISBN 978-0-521-36439-3. ↑ Rossi, Bruno Benedetto (1990). Moments in the Life of a Scientist. Cambridge University Press. pp. 31–33. ISBN 978-0-521-36439-3. ↑ Bonolis, Luisa (March 2011). "Bruno Rossi and the Racial Laws of Fascist Italy" (PDF). Physics in Perspective. 13 (1): 58–90. Bibcode:2011PhP....13...58B. doi:10.1007/s00016-010-0035-4. Retrieved 22 January 2013. ↑ Rossi, Bruno Benedetto (1990). Moments in the Life of a Scientist. Cambridge University Press. pp. 39–40. ISBN 978-0-521-36439-3. ↑ Rossi, Bruno Benedetto (1990). Moments in the Life of a Scientist. Cambridge University Press. pp. 40–41. ISBN 978-0-521-36439-3. ↑ Bethe, H.; W. Heitler (27 February 1934). "On the Stopping of Fast Particles and on the Creation of Positive Electrons" (PDF). Proceedings of the Royal Society A. 146: 83–112. Bibcode:1934RSPSA.146...83B. doi:10.1098/rspa.1934.0140. Retrieved 26 December 2012. ↑ Bhaba, H. J.; W. Heitler (December 11, 1936). "The Passage of Fast Electrons and the Theory of Cosmic Showers" (PDF). Proceedings of the Royal Society A. 159: 432–458. Bibcode:1937RSPSA.159..432B. doi:10.1098/rspa.1937.0082. Retrieved 27 December 2012. ↑ Jánossy, L.; B. Rossi (17 November 1939). "On the photon component of cosmic radiation and its absorption coefficient" (PDF). Proceedings of the Royal Society A. 175 (960): 88–100. Bibcode:1940RSPSA.175...88J. doi:10.1098/rspa.1940.0045. Retrieved 26 December 2012. ↑ Neddermeyer, Seth H.; Carl D. Anderson (30 March 1937). "Note on the Nature of Cosmic-Ray Particles". Physical Review. 51 (10): 884–886. Bibcode:1937PhRv...51..884N. doi:10.1103/PhysRev.51.884. Retrieved 27 December 2012. ↑ Lattes, C. M. G; Occhialini, G. P. S.; Powell, C. F. (11 October 1947). "Observations on the Tracks of Slow Mesons in Photographic Emulsions". Nature. 160 (4067): 486–492. Bibcode:1947Natur.160..486L. doi:10.1038/160486a0. PMID 20267548. Retrieved 27 December 2012. ↑ Blackett, P. M. S. Blackett (10 October 1938). "On the Instability of the Barytron and the Temperature Effect of Cosmic Rays". Physical Review. 54 (11): 973–974. Bibcode:1938PhRv...54..973B. doi:10.1103/PhysRev.54.973. Retrieved 28 December 2012. ↑ Rossi, Bruno Benedetto (1990). Moments in the Life of a Scientist. Cambridge University Press. pp. 45–46. ISBN 978-0-521-36439-3. ↑ "Guide to the Norman Hilberry Papers 1961". Special Collections Research Center. University of Chicago Library. 2007. Retrieved 6 January 2013. ↑ Redding, Clay; K. Hayes (24 January 2001). "Finding Aid to the J. Barton Hoag Papers, 1914–1963". Center for History of Physics. American Institute of Physics. Retrieved 6 January 2013. ↑ Rossi, Bruno; Hilberry, Norman; Hoag, J. Barton (10 January 1940). "The Variation of the Hard Component of Cosmic Rays with Height and the Disintegration of Mesotrons". Physical Review. 57 (6): 461–469. Bibcode:1940PhRv...57..461R. doi:10.1103/PhysRev.57.461. Retrieved 4 January 2013. ↑ Rossi, Bruno; David B. Hall (13 December 1940). "Variation of the Rate of Decay of Mesotrons with Momentum". Physical Review. 59 (3): 223–228. Bibcode:1941PhRv...59..223R. doi:10.1103/PhysRev.59.223. Retrieved 5 January 2013. ↑ Rossi, Bruno Benedetto (1990). Moments in the Life of a Scientist. Cambridge University Press. pp. 57–59. ISBN 978-0-521-36439-3. ↑ Rossi, Bruno; Kenneth Greisen (October 1941). "Cosmic-Ray Theory". Reviews of Modern Physics. 13 (4): 240–309. Bibcode:1941RvMP...13..240R. doi:10.1103/RevModPhys.13.240. Retrieved 13 January 2013. ↑ Bonolis, Luisa (November 2011). "Walther Bothe and Bruno Rossi: The birth and development of coincidence methods in cosmic-ray physics". American Journal of Physics. 79 (11): 1133–1182. arXiv:1106.1365 . Bibcode:2011AmJPh..79.1133B. doi:10.1119/1.3619808. ↑ Rossi, Bruno; Kenneth Greisen; Joyce C. Stearns; Darol K. Froman; Phillipp G. Koontz (23 March 1942). "Further Measurements of the Mesotron Lifetime". Physical Review Letters. 61 (11-12): 675–679. Bibcode:1942PhRv...61..675R. doi:10.1103/PhysRev.61.675. Retrieved 15 January 2013. ↑ Rossi, Bruno; Kenneth Greisen (1 December 1941). "Origin of the Soft Component of Cosmic Rays". Physical Review Letters. 61 (3–4): 121–128. Bibcode:1942PhRv...61..121R. doi:10.1103/PhysRev.61.121. Retrieved 13 January 2013. ↑ Rossi, Bruno; Norris Nereson (8 January 1943). "Experimental Arrangement for the Measurement of Small Time Intervals between the Discharges of Geiger‐Müller Counters". Review of Scientific Instruments. 17 (2): 65–72. Bibcode:1946RScI...17...65R. doi:10.1063/1.1770435. Retrieved 16 January 2013. ↑ Rossi, Bruno; Norris Nereson (17 September 1942). "Experimental Determination of the Disintegration Curve of Mesotrons" (PDF). Physical Review Letters. 62 (9-10): 417–422. Bibcode:1942PhRv...62..417R. doi:10.1103/PhysRev.62.417. Retrieved 13 January 2013. ↑ Nereson, Norris; Bruno Rossi (26 July 1943). "Further Measurements on the Disintegration Curve of Mesotrons" (PDF). Physical Review Letters. 64 (7-8): 199–201. Bibcode:1943PhRv...64..199N. doi:10.1103/PhysRev.64.199. Retrieved 17 January 2013. ↑ Conversi, M.; O. Piccioni (1 April 1944). "Misura diretta della vita media dei mesoni frenati". Il Nuovo Cimento. 2 (1): 40–70. doi:10.1007/BF02903045. Retrieved 16 January 2013. ↑ Monaldi, Daniela (2008). 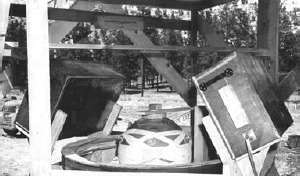 "The Indirect Observation of the Decay of Mesotrons: Italian Experiments on Cosmic Radiation, 1937–1943" (PDF). History and Foundations of Quantum Mechanics; Preprint 328. Max-Planck-Institut fur Wissenschaftsgeschichte. Retrieved 16 January 2013. ↑ Rossi, Bruno; Kenneth I. Greisen (Feb 1, 1946). "Range Tracking Circuit". Patent number: 2903691. US Patent and Trademark Office. Retrieved 17 January 2013. ↑ Rossi, Bruno Benedetto (1990). Moments in the Life of a Scientist. Cambridge University Press. pp. 67–68. ISBN 978-0-521-36439-3. 1 2 Rossi, Bruno Benedetto (1990). Moments in the Life of a Scientist. Cambridge University Press. pp. 76–78. ISBN 978-0-521-36439-3. ↑ "David B. Nicodemus Papers, 1945–1989". Special Collections & Archives Research Center. Oregon State University Libraries. Retrieved 18 January 2013. ↑ Rossi, Bruno; Hans Staub (28 October 1946). "Ionization Chambers and Counters" (PDF). Manhattan Project Technical Series LA-1003. Los Alamos National Laboratory. Retrieved 18 January 2013. ↑ Allen, James S.; Bruno Rossi (23 July 1944). "Time of collection of electrons in ionization chambers." (PDF). LA-115. Los Alamos National Laboratory. Retrieved 18 January 2013. ↑ Allen, James S.; Bruno B. Rossi (6 November 1946). "Method And Means For Detecting Ionization". Patent number: 2485469. US Patent and Trademark Office. Retrieved 19 January 2013. ↑ Hoddeson, Lillian; Henriksen, Paul W.; Meade, Roger A.; Westfall, Catherine L. (1993). Critical Assembly: A Technical History of Los Alamos During the Oppenheimer Years, 1943–1945. New York: Cambridge University Press. pp. 130–137. ISBN 0-521-44132-3. OCLC 26764320. ↑ Dummer, J. E.; Taschner, J. C.; Courtright, C. C. (April 1996). "The Bayo Canyon/Rasioactive Lanthanum (RaLa) Program" (PDF). LA-13044-H. Los Alamos National Laboratory. Retrieved 18 January 2013. 1 2 Taschner, John C. "The RaLa/Bayo Canyon Implosion Program" (PDF). Sierra Nevada Chapter. Health Physics Society. Retrieved 20 January 2013. ↑ Hoddeson, Lillian; Henriksen, Paul W.; Meade, Roger A.; Westfall, Catherine L. (1993). Critical Assembly: A Technical History of Los Alamos During the Oppenheimer Years, 1943–1945. New York: Cambridge University Press. pp. 146–154. ISBN 0-521-44132-3. OCLC 26764320. 1 2 3 Hoddeson, Lillian; Henriksen, Paul W.; Meade, Roger A.; Westfall, Catherine L. (1993). Critical Assembly: A Technical History of Los Alamos During the Oppenheimer Years, 1943–1945. New York: Cambridge University Press. pp. 353–356. ISBN 0-521-44132-3. OCLC 26764320. ↑ "The Nobel Prize in Physics 1952". The Nobel Foundation. Retrieved 31 May 2013. ↑ Hoddeson, Lillian; Henriksen, Paul W.; Meade, Roger A.; Westfall, Catherine L. (1993). Critical Assembly: A Technical History of Los Alamos During the Oppenheimer Years, 1943–1945. New York: Cambridge University Press. pp. 374–377. ISBN 0-521-44132-3. OCLC 26764320. ↑ "The History of the MIT Department of Physics". Big Physics at MIT : 1946–1970. Massachusetts Institute of Technology. Retrieved 2 February 2013. ↑ Goldstein, Jack S. (1992). A Different Sort of Time: the Life of Jerrold R. Zacharias, Scientist, Engineer, Educator. Cambridge, Massachusetts: MIT Press. pp. 66–70. ISBN 0-262-07138-X. OCLC 24628294. ↑ Rossi, Bruno Benedetto (1990). Moments in the Life of a Scientist. Cambridge University Press. p. 99. ISBN 978-0-521-36439-3. ↑ Goldstein, Jack S. (1992). A Different Sort of Time: the Life of Jerrold R. Zacharias, Scientist, Engineer, Educator. Cambridge, Massachusetts: MIT Press. pp. 74–78. ISBN 0-262-07138-X. OCLC 24628294. ↑ Rossi, Bruno Benedetto (1990). Moments in the Life of a Scientist. Cambridge University Press. pp. 101–102. ISBN 978-0-521-36439-3. ↑ Lattes, C. M. G.; Muirhead, H.; Occhialini, G. P. S.; Powell, C. F. (24 May 1947). "Processes Involving Charged Mesons" (PDF). Nature. 159 (4047): 694–697. Bibcode:1947Natur.159..694L. doi:10.1038/159694a0. Retrieved 27 December 2012. ↑ "Dr. Herbert S. Bridge Dies at 76". MIT news. Massachusetts Institute of Technology. 1 September 1995. Retrieved 17 February 2013. ↑ Bridge, Herbert S.; Bruno Rossi (13 February 1947). "Cosmic-Ray Bursts in an Unshielded Chamber and Under One Inch of Lead at Different Altitudes". Physical Review. 71 (6): 379–380. Bibcode:1947PhRv...71..379B. doi:10.1103/PhysRev.71.379.2. Retrieved 17 February 2013. ↑ Gregory, B. P.; Rossi, B.; Tinlot, J. H. (2 December 1948). "Production of Gamma-Rays in Nuclear Interactions of Cosmic Rays". Physical Review. 77 (2): 299–300. Bibcode:1950PhRv...77..299G. doi:10.1103/PhysRev.77.299.2. Retrieved 19 February 2013. ↑ Rossi, Bruno Benedetto (1990). Moments in the Life of a Scientist. Cambridge University Press. p. 116. ISBN 978-0-521-36439-3. ↑ Bridge, h. S.; M. Annis (12 March 1951). "A Cloud-Chamber Study of the New Unstable Particles". Physical Review. 82 (3): 445–446. Bibcode:1951PhRv...82..445B. doi:10.1103/PhysRev.82.445.2. Retrieved 19 February 2013. ↑ Benjamin, Stan (25 April 1950). "WSSF Provides Education for Five European Dp's" (PDF). The Tech. MIT. p. 2. Retrieved 20 February 2013. ↑ Annis, M.; H. S. Bridge; S. Olbert (10 December 1952). "Application of the Multiple Scattering Theory to Cloud-Chamber Measurements. II". Physical Review. 89 (6): 1216–1227. Bibcode:1953PhRv...89.1216A. doi:10.1103/PhysRev.89.1216. Retrieved 20 February 2013. 1 2 Bridge, H. S.; Peyrou, C.; Rossi, B.; Safford, R. (26 February 1953). "Cloud-Chamber Observations of the Heavy Charged Unstable Particles in Cosmic Rays". Physical Review. 90 (5): 921–933. Bibcode:1953PhRv...90..921B. doi:10.1103/PhysRev.90.921. Retrieved 19 February 2013. ↑ Montanet, Lucien (1 June 2003). "Charles Peyrou and his impact on physics". CERN Courier. CERN. Retrieved 20 February 2013. 1 2 3 Cronin, James W. (22 November 2011). "The 1953 Cosmic Ray Conference at Bagneres de Bigorre". European Physical Journal H. 36 (2): 183–201. arXiv:1111.5338 . Bibcode:2011EPJH...36..183C. doi:10.1140/epjh/e2011-20014-4. ↑ "William B. Fretter, Physicist, 74". The New York Times. The New York Times Company. 28 March 1991. Retrieved 25 February 2013. ↑ Bridge, H. S.; Courant, H.; DeStaebler, Jr., H.; Rossi, B. (21 June 1954). "Possible Example of the Annihilation of a Heavy Particle". Physical Review. 95 (4): 1101–1103. Bibcode:1954PhRv...95.1101B. doi:10.1103/PhysRev.95.1101. Retrieved 19 February 2013. ↑ Bridge, H. S.; D. O. Caldwell; Y. Pal; B. Rossi (3 March 1956). "Further Analysis of the Massachusetts Institute of Technology Antiproton Event". Physical Review. 102 (3): 930–931. Bibcode:1956PhRv..102..930B. doi:10.1103/PhysRev.102.930. Retrieved 26 February 2013. ↑ Chamberlain, Owen; Emilio Segrè; Clyde Wiegand; Thomas Ypsilantis (24 October 1955). "Observation of Antiprotons". Physical Review. 100 (3): 947–950. Bibcode:1955PhRv..100..947C. doi:10.1103/PhysRev.100.947. Retrieved 26 February 2013. ↑ "The Nobel Prize in Physics 1959". The Nobel Foundation. Retrieved 31 May 2013. ↑ Auger, P.; P. Ehrenfest; R. Maze; J. Daudin; Robley A. Fréon (1939). "Extensive Cosmic-Ray Showers". Reviews of Modern Physics. 11 (3-4): 288–291. Bibcode:1939RvMP...11..288A. doi:10.1103/RevModPhys.11.288. Retrieved 10 March 2013. ↑ Williams, Robert W. (24 August 1948). "The Structure of the Large Cosmic-Ray Air Sho". Physical Review. 74 (11): 1689–1706. Bibcode:1948PhRv...74.1689W. doi:10.1103/PhysRev.74.1689. Retrieved 10 February 2013. ↑ Bassi, P.; G. Clark; B. Rossi (13 July 1953). "Distribution of Arrival Times of Air Shower Particles". Physical Review. 92 (2): 441–451. Bibcode:1953PhRv...92..441B. doi:10.1103/PhysRev.92.441. Retrieved 10 March 2013. 1 2 3 4 5 Rossi, Bruno Benedetto (1990). Moments in the Life of a Scientist. Cambridge University Press. pp. 121–129. ISBN 978-0-521-36439-3. ↑ McCammon, Dan; George W. Clark (2010). "William Lester Kraushaar, 1920–2008" (PDF). Biographical Memoirs, Online Collection. National Academy of Sciences. Retrieved 22 March 2013. ↑ Clark, G. W.; F. Scherb; W. B. Smith (31 January 1957). "Preparation of Large Plastic Scintilla". Review of Scientific Instruments. 28 (6): 433. Bibcode:1957RScI...28..433C. doi:10.1063/1.1715900. Retrieved 22 March 2013. ↑ Clark, G.; J. Earl; W. Kraushaar; J. Linsley; B. Rossi; F. Scherb (24 August 1957). "An Experiment on Air Showers Produced by High-Energy Cosmic Rays". Nature. 180: 353–356. Bibcode:1957Natur.180..353C. doi:10.1038/180353a0. Retrieved 21 March 2013. ↑ Clark, G. W.; J. Earl; W. L. Kraushaar; J. Linsley; B. B. Rossi; F. Scherb; D. W. Scott (13 December 1960). "Cosmic Ray Air Showers at Sea-Level". Physical Review. 122 (2): 637–654. Bibcode:1961PhRv..122..637C. doi:10.1103/PhysRev.122.637. Retrieved 21 March 2013. ↑ Rossi, Bruno Benedetto (1990). Moments in the Life of a Scientist. Cambridge University Press. p. 124. ISBN 978-0-521-36439-3. ↑ Chitnis, E. V.; V. A. Sarabhai; G. Clark (21 March 1960). "Arrival Directions of Cosmic-Ray Air Showers from the Equatorial Sky". Physical Review. 119 (3): 1085–1091. Bibcode:1960PhRv..119.1085C. doi:10.1103/PhysRev.119.1085. Retrieved 22 March 2013. ↑ "Ismael Escobar Vallejo, 90, La Plata". The Independent. Southern Maryland Newspapers/Online. 5 June 2009. Retrieved 22 March 2013. ↑ Hersil, J.; I. Escobar; D. Scott; G. Clark; S. Olbert (28 November 1961). "Observations of Extensive Air Showers near the Maximum of Their Longitudinal Development". Physical Review Letters. 6 (1): 22–23. Bibcode:1961PhRvL...6...22H. doi:10.1103/PhysRevLett.6.22. Retrieved 22 March 2013. ↑ Linsley, John; Livio Scarsi (5 July 1963). "Cosmic-Ray Composition at 1017 - 1018 eV". Physical Review Letters. 9 (3): 123–125. Bibcode:1962PhRvL...9..123L. doi:10.1103/PhysRevLett.9.123. Retrieved 23 March 2013. ↑ Linsley, J.; L. Scarsi; P. J. Eccles; B. B. Rossi (22 February 1962). "Isotropy of Cosmic Radiation". Physical Review Letters. 9 (7): 286–287. Bibcode:1962PhRvL...8..286L. doi:10.1103/PhysRevLett.8.286. Retrieved 23 March 2013. ↑ Linsley, John (10 January 1963). "Evidence for a Primary Cosmic-Ray Particle with Energy 1020 eV". Physical Review Letters. 10 (4): 146–148. Bibcode:1963PhRvL..10..146L. doi:10.1103/PhysRevLett.10.146. Retrieved 23 March 2013. ↑ Smolin, Lee (2006). The Trouble With Physics. Boston: Houghton Mifflin Harcourt. pp. 219–222. ISBN 978-0-618-55105-7. 1 2 Peoples, Columbia (2008). "Sputnik and 'skill thinking' revisited: technological determinism in American responses to the Soviet missile threat". Cold War History. 8 (1): 55–75. doi:10.1080/14682740701791334. ↑ Defense Advanced Research Projects Agency: Technology Transition. Washington, D.C.: Defense Advanced Research Projects Agency. 1997. p. 9. OCLC 38197909. 1 2 Naugle, John E. (6 August 2004). "First Among Equals : The Space Science Board". NASA Office of Management Scientific and Technical Information Program. Retrieved 24 April 2013. 1 2 Rossi, Bruno Benedetto (1990). Moments in the Life of a Scientist. Cambridge University Press. pp. 130–133. ISBN 978-0-521-36439-3. 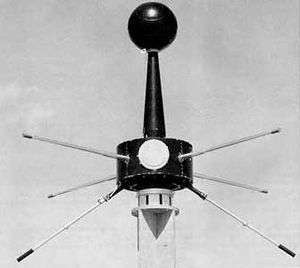 ↑ "Goddard's First Homegrown Satellite, Explorer 10". Geeked on Goddard. NASA. 25 March 2011. Retrieved 25 April 2013. 1 2 Bonetti, A.; Bridge, H. S.; Lazarus, A. J.; Rossi, B.; Scherb, F. (1 July 1963). "Explorer 10 plasma measurements". Journal of Geophysical Research. 68 (13): 3745–4155. Bibcode:1963JGR....68.4017B. doi:10.1029/JZ068i013p04017. Retrieved 28 April 2013. ↑ "The Magnetopause". NASA. Retrieved 11 July 2013. ↑ Newell, Homer. "The Magnetosphere". Beyond the Atmosphere: Early Years of Space Science. NASA History Office. Retrieved 28 April 2013. ↑ "NSSDC Information on IMP 8". NASA National Space Science Data Center. Retrieved 3 May 2013. ↑ "MIT Space Plasma Group". MIT. Retrieved 29 April 2013. ↑ Rossi, Bruno Benedetto (1990). Moments in the Life of a Scientist. Cambridge University Press. pp. 151–153. ISBN 978-0-521-36439-3. 1 2 Bitterman, Jay. "Astronomy Bio...Bruno Rossi". The Lake County Astronomical Society. Retrieved 11 July 2013. 1 2 3 4 5 6 7 Clark, George W. "Bruno Benedetto Rossi April 13, 1905 — November 21, 1993". National Academy Press. Retrieved 7 July 2013. ↑ Reddy, Frances. "NASA's Rossi X-Ray Timing Explorer Completes Mission Operations". NASA. Retrieved 11 July 2013. ↑ "Rossi prize". High Energy Astrophysics Division, American Astronomical Society. Retrieved 28 May 2011. ↑ "Claude Canizares – Bruno Rossi Professor of Physics". Massachusetts Institute of Technology. Retrieved 11 July 2013.